Similarly, if you have iLife installed, there are a bunch of fonts that come with iDVD, not available to the rest of the system. These are in /Applications/iDVD.app/Contents/Resources/Fonts (Ctrl-Click on iDVD.app and select “Show Package Contents” to get there). Eight different versions of Lucida come with your standard installation of Java, but can only be found by going to /System/Library/Frameworks/JavaVM.framework/Home/lib/fonts/ (again, with the “Show Package Contents” trick). A font called Matrix Ticker is available in the ESPN widget, which is installed by default. It’s at /Library/Widgets/ESPN.wdgt/ESPNTicker.dfont. 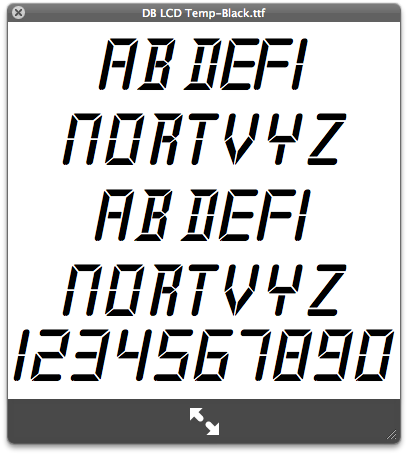 Another two widget fonts, found inside the Unit Converter widget, are at /Library/Widgets/Unit Converter.wdgt/DB LCD Temp-Black.ttf and/Library/Widgets/Unit Converter.wdgt/UC-LCD.ttf. These are pretty cool, mimicking the look of a seven-segment display.